This area map shows the National Cycle Network and local routes in this area. 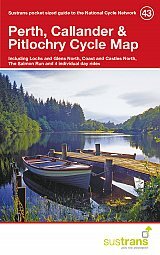 It covers Perth and Kinross region in Scotland, including Dunblane, Callander, Killin, Bridge of Allen, Perth, Kinross and The Trossachs.This pocket-sized colour map shows clearly mapped on-road and traffic-free paths, easy to read contours, and detailed inset maps for the major towns and cities as well as recommended linking routes connecting the NCN with quiet roads. The map also features 4 day rides with directions and a description of the area, highlighting key cycle routes and places of interest.